Nassak Diamond, from Amaragiri Mines was Eye of Idol at Timbakeshwar Shiva Temple during 1725-1817 CE. Peshwa Bajirao-2 gave it to East India Company by Treaty of Bassein. Nassak Diamond, was the Eye of the Idol at Nashik, Trimbakeshwar temple of Lord Siva for more than 92 years. It was originally extracted from Amaragiri mines (currently in Mahabubnagar district, Telangana, India) during late 15th century. 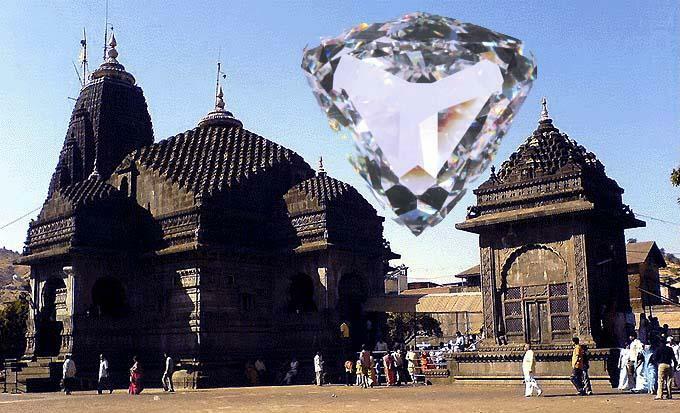 The original uncut diamond was 89 carats and it adorned the Sivalinga in the Trimbakeshwar Shiva Temple, near Nashik (Nassak), India on the upper Godavari River. As priests worshiped Siva, the diamond eventually acquired its name from its long-term proximity to Nashik. When Maratha empire was strong in central to west India, Bajirao has already removed the Nassak Diamond from Trimbakeshwar temple and kept it in his posession. In 1818 CE the then Peshwa, Bajirao 2nd, was defeated in battle, and signed the treaty of Bassein. n 1817, the British East India Company and Maratha Empire began the 3rd Anglo-Maratha War. During this Maratha war, the Nassak Diamond was removed from the Siva temple and kept in posession of Peshwa Baji Rao-2. The war ended in 1818 CE and the British East India Company took control of most of India. 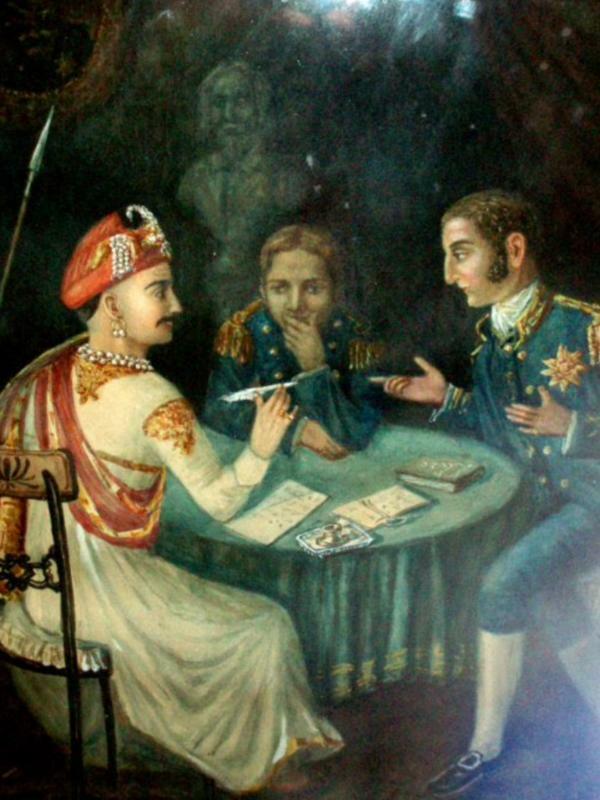 When he signed the treaty, Peshwa handed over the Nassak Diamond to an English colonel named J. Briggs. In turn, Briggs delivered the diamond to Francis Rawdon-Hastings, the 1st Marquess of Hastings who had conducted the military operations against the Peshwa. Rawdon-Hastings delivered the diamond to the East India Company as part of the spoils of the Maratha war. East India Company then sent the Nassak Diamond to England, to be sold on the London diamond market in 1818 CE. It is wrong to assume that Britishers stole the Nassak Diamond from Siva Temple. It was Bajirao, who gave it away after losing war, to protect himself. Originally, it was taken away by the Peshwas. Nana Peshwa in 1725 CE vowed before Lord Trimbakeshwar, to gift the said diamond to the temple if he succeeded in breaking the siege of Trimbakeshwar fort. He won and donated the diamond to this temple. At that time, deity’s crown was then studded with many jewels and the Nassak diamond. The original diamond (even today) is transparent in color and has shades of blue when seen in light. London market concluded that the 89 carats (17.8 g) diamond was actually of great purity, but bad form. It was cut many times to acheive closest shape of Koh-i-noor diamond. 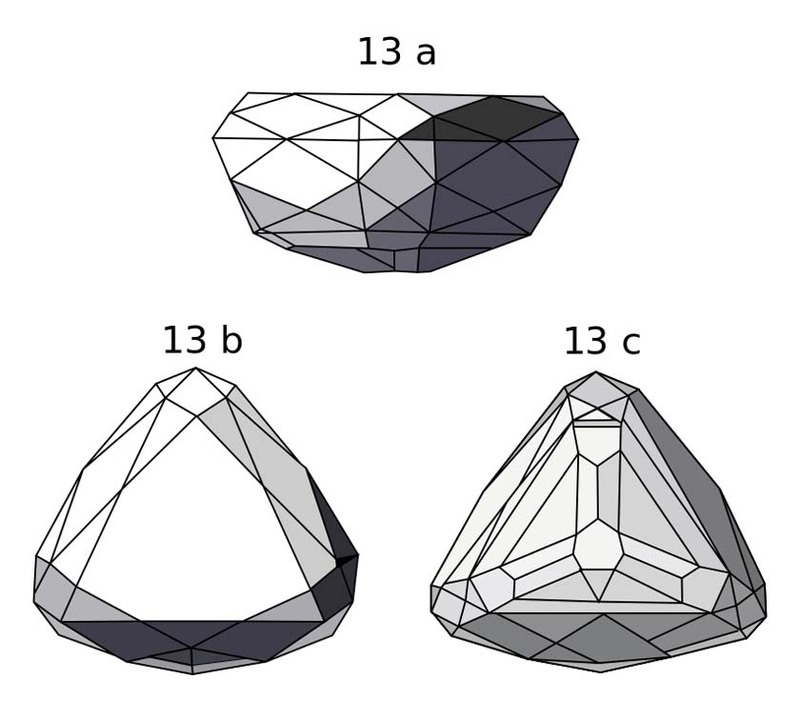 Illustrations in Herbert Tillander’s book “Diamond Cuts in Historic Jewelry – 1381 to 1910” show it as being a semi-triangular moghal cut with a plateau top, similar looking to the 115-carat Taj-E-Mah Diamond which resides in the Iranian Crown Jewels. Despite its appearance, the diamond was sold for about 3,000 pounds (equivalent today to £198,000) to Rundell and Bridge, a British jewellery firm based in London. Rundell and Bridge held onto the diamond for the next 13 years. During that time, the jewellery firm instructed its diamond cutter “to keep as closely as possible to the traces of the Hindu cutter, amending his defects, and accommodating the pattern to the exigencies of the subject matter.” The recut by Rundell and Bridge from 89.75 carats (17,950 mg) to 78.625 carats (15,725.0 mg) resulted of a loss of no more than 10 percent of the original weight of the diamond. In 1831, Rundell and Bridge sold the diamond to the Emanuel Brothers for about 7200 pounds (today about £590,000). In 1837, the Emanuel Brothers sold the Nassak Diamond at a public sale to Robert Grosvenor, the 1st Marquess of Westminster. At one point, the Marquess mounted the diamond in the handle of his dress sword. In 1886, the diamond was valued at between 30,000 and 40,000 pounds (today between £2,947,000 and £3,930,000), due in part to its vast gain in brilliancy from the re-cut by Rundell and Bridge. In March 1927, the Duke of Westminster used US importers Mayers, Osterwald & Muhlfeld to sell the diamond to Parisian jeweller George Mauboussin, who was living in the United States at the time. During 1929-30, this diamond was attempted for robbery by a gang of four, but they missed it twice. In early April 1970, the diamond was rated one of the thirty great stones of the world and placed on display at Parke-Bernet Galleries in New York City. On 16 April 1970, the diamond was sold at auction for $500,000 (allowing for inflation, this would now be $3.08 million) to Edward J. Hand, a then 48-year-old trucking firm executive from Greenwich, Connecticut. 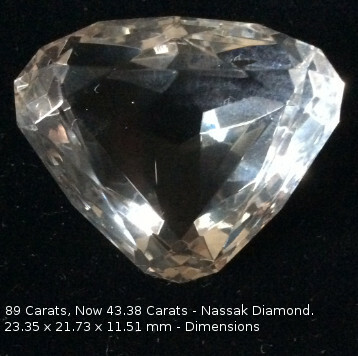 Nassak diamond was placed on display in November 1976 at a charity benefit as a means to attract donors to that benefit. Today, Nassak Diamond is at display in a private museum in Lebanon.